Lawn Fawn did it again. Made me buy a stamp set because I just “saw” a card using it when I caught just a sneak peek of the stamp set again! (Am I alone in this!?) I knew I was going to make an interactive card, but — I did have some things to work out as I went. I even included footage of part that showed my error in construction, in case it helps you next time you’ve colored and cut something out only to say, “Whoops!” Watch the video below or click HERE to see it in HD on YouTube. The spinner reveals all four flavors….banana, strawberry, blueberry, and mixed! Love your work and your presentation skills. Was looking to become a “patron” but could not locate. Also would love to get your catalogs. What does one do? You are a true inspiration. I simply had to try one of these myself. I gad a few oops moments but I am proud I got as far as I did. Your crafty genius has my creative mojo going again. Thanks! I am a patron, but cannot find the page with this masking video. 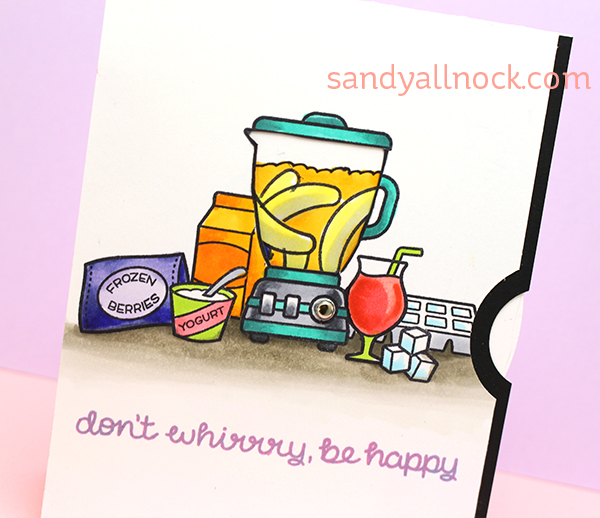 I love this card so much I actually made it–well, made 2 of them actually, and am working on a 3rd. You explained everything really well, but I am still perfecting my cards. Really really cute, though. Thank you so much for the idea. I will post pictures of my efforts on my blog soon. Super fun and beautifully done! Love this set! Love this viewfinder interactive card. So creative. Thanks for the video and sharing your fix ith the black cardstock. Oh Sandy, you are amazing! I so love this card. Now I want to stay home & play!!! So clever! What a cool card! Great video showing your process to make the card and I just wonder how you come up with the idea! LOVE this, and I have this set, but don’t know that I’m ambitious enough to try what you did. Just wonderful!!!!! Thank you for sharing. Love this idea! Absolutely adorable! You just made me want another stamp set. Thanks for sharing this fun card! Oh my God this is amazing!!!! Love it!!! Great video. I like your spinner card as well as how you told us to “fix” a tiny mistake. This is SO cute Sandy. Love that blender. I haven’t made one of these in years. I really should try again as I have SO MUCH more to work with now. LOL I would be fun! Amazing job on this card. Love the spinner element! 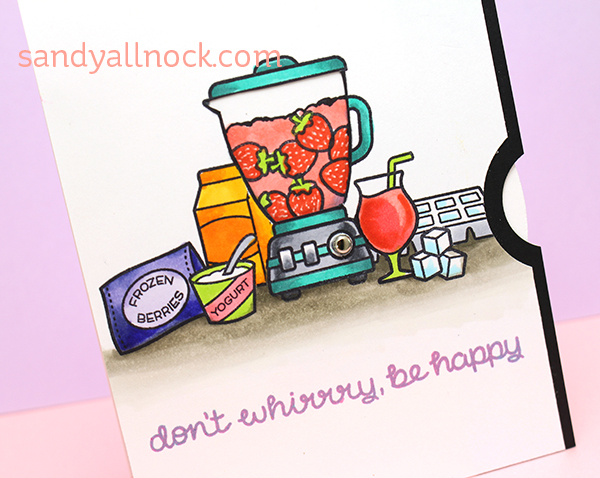 Yep, I ordered this stamp set based on a partial sneak peek of a card that used it! I haven’t inked it up yet, but it’s sitting on my craft table taunting me. 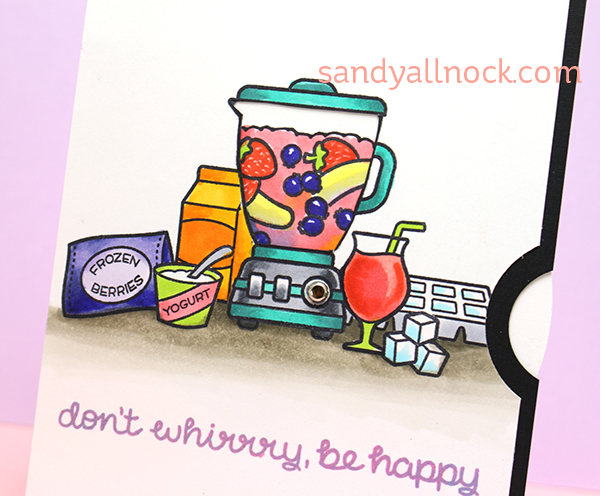 Love your color combination as well as the interactive twist. Great card! 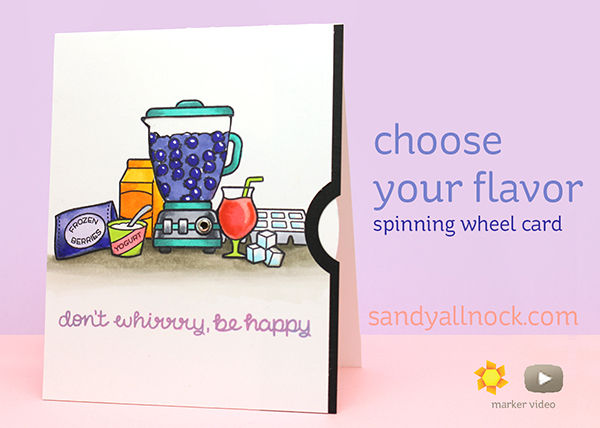 Love your flavors on the spinning wheel. You explained the process and the stamp placement so clearly. Thanks for sharing! What an awesome interactive card. Absolutely love it.